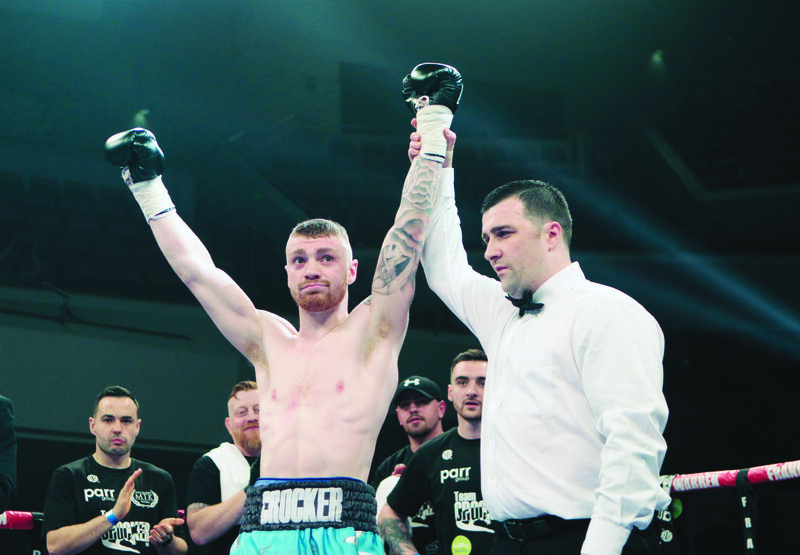 HE had to wait a little longer to make his professional debut than he had hoped, but Lewis Crocker wasted no time in announcing himself when he got into the ring at the Waterfront Hall on Friday night. The South Belfast man took just 67 seconds to blast out Ferenc Jarko with his much vaunted punching power evident from the off. Jarko actually looked to have ambitions of victory early on when popping out his jab, but Crocker connected with a left that staggered the Hungarian back onto the ropes. It was clear the power was there and a left followed by a huge right dropped Jarko who did well to beat the count, but the follow-up assault left referee Eamonn Magill with no option but to stop the fight to the delight of Crocker’s large support. “I had planned this in my head for months, so I wasn’t even nervous going into the ring because I had played this fight out in my head so many times,” said the 20 year-old after. With injury forcing him off the November 5 bill when he was due to make his professional bow, Crocker was simply delighted to finally get in the ring, but he says there will be no great rush to chase after title shots or call out opponents. For now he is happy to develop naturally and gain his pro experience with a long career ahead. “The way things panned out, I’m glad,” he added. “It’s the best job in the world. I’m delighted and can’t wait to get in the ring again. “I only turned 20 at the start of the year so I’ve years to go. I’m not going to start calling people out now or going for big fights. “I have a great team with me in MTK and promoted by Frank Warren, so it will be steady progress for now and take it to the top. It was also a good night for Marc McCullough who warmed up for his British featherweight title fight against Ryan Walsh with a comfortable points win over Leonel Hernandez. McCullough had his opponent down in the first with ha right hand, but could not find the finish against a man who has proven his toughness throughout his career against heavy-handed opposition. “He was as tough as old boots,” agreed Marco after his 80-71 points win. Steven Ward made it three wins from three as a pro with a 40-36 points win over Curtis Gargano at light-heavyweight, while heavyweights Con Sheehan and Sean Turner scored victories over Ferenc Zsalek (80-71 points) and Igor Mihaljevic (KO2) respectively and visitors, Gary Corcoran and Troy Williamson returned with wins over local opponents, James Gorman (TKO5 ) and Casey Blair (TKO3).